We both had days off, and neither of us had to be back at any specific time, so the drive from Cincinnati to Pittsburgh was a leisurely one. We stopped at an outlet mall. 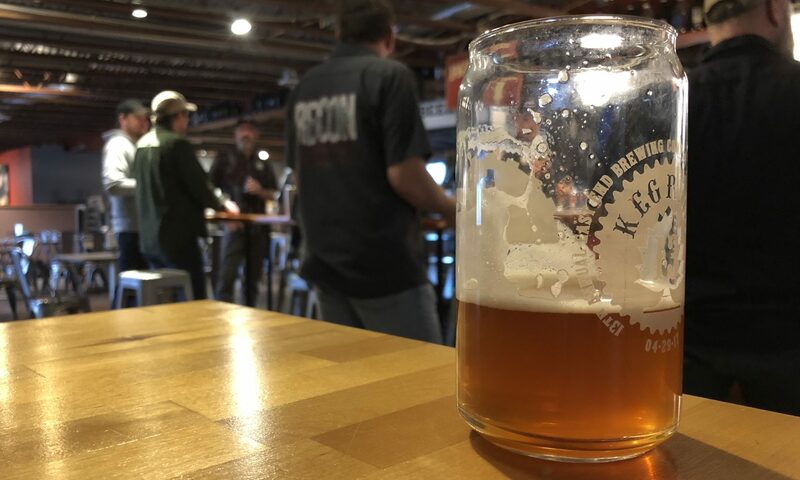 We visited the Andersons store in Pickerington to check out their beer. And, as I told you before, we ate pretty well. In fact, our breakfast on Monday makes this whole post worthwhile. We spent Sunday night in Mason, which I had previously known as the town closest to Kings Island, the giant amusement park where I spent many teenaged days being amused. The town itself is a little odd; it’s the home of Procter and Gamble, and the tax revenue provided by the company has to be off the charts. City-maintained landscaping dotted every corner of every boulevard, and the strip malls — including the one where we were headed — were nicely tucked out of view. Still, it wasn’t hard to find the Mason location of Blue Ash Chili, a 40-year-old local chain of chili parlors which specialize in Cincinnati’s local delicacy. 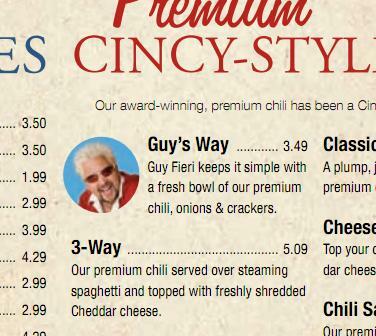 Forgive me if I’ve explained this to you in person, but Cincinnati chili is different. The spices are Mediterranean and not Mexican; yes, that’s cinnamon, allspice, nutmeg and maybe even a little cocoa powder. The beef is finely chopped, so the chili has an almost-smooth consistency. And it’s served over spaghetti. This is not negotiable. 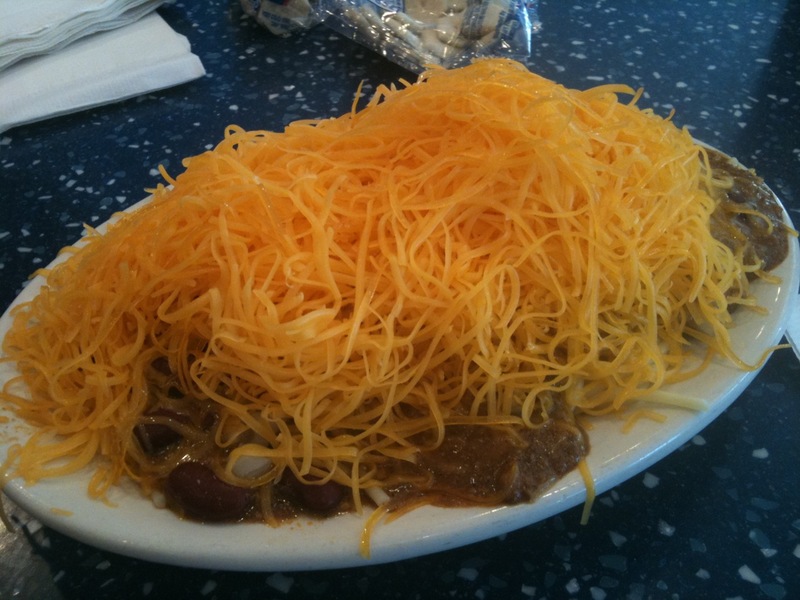 The base is the three-way, which is usually chili, spaghetti and a mound of finely grated cheddar. Four-way? Add kidney beans. Five-way? Add onions. Oyster crackers aren’t a “way” in and of themselves, but they are practically required as well. Add some shakes of hot sauce, and you’re ready to go. 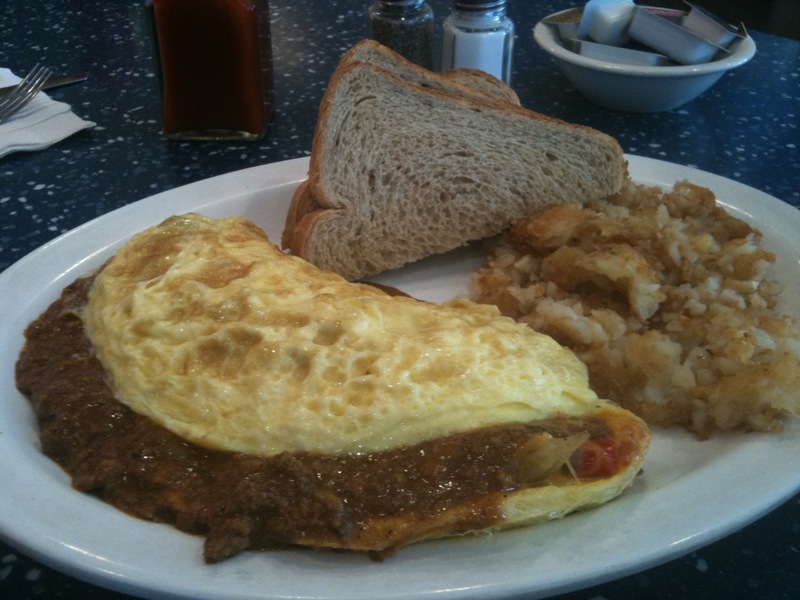 Mrs. Crappy thought it was a little too early in the morning for something that didn’t resemble breakfast; besides, she had had her heart set on a chili omelette since before we left for the trip. Yeah, I know I posted this pic already. It was good enough to be worth it. I have no such hang-ups, so 10:30 a.m. seemed like the perfect time for a five way and a side of fries. Mrs. Crappy’s breakfast looked delicious, but I made the right choice. Here’s the funny thing. When I first looked at the menu online, I couldn’t help but notice that there were Food Network logos everywhere. This was thanks to a visit by Guy Fieri and his Diners, Drive-Ins and Dives show. I’ve always found Guy to be a little cheesy, but I’ve never had a huge problem with his show (unlike some friends of mine, who seem to react violently to the very mention of his name). So let’s recap: Three-way. Four-way. Five-way. And Guy’s Way? The Wrong-way. i’d take guy ANY and every way. LOVE. although now i am craving that goofy five way chili. only had it once and really liked it. Next PostNext catch the wave.